Whether you have a Samsung phone or a Google phone, Device information provides an overview of the smartphone or tablet specifications. You should check the system information matches your expectations, including the device model, operating system version, security patch revision, system uptime, screen size and resolution, memory size, storage size, and camera resolution. The most important information is bolded, some information is color-coded – such as a very old security patch level or short system uptime (which can suggest an unstable system) may be shown in red or orange. If your smartphone supports a MicroSD card and you inserted it (recommended) then you should check the “Primary shared storage” shows the MicroSD card size and that it is removable. This shows the MicroSD slot basic functionality is OK. If your internal storage is less than a low-level threshold, some suggestions are provided to free up space. Android 7.1 (and later) includes a storage cleanup tool, and a link to this is provided by the app when there is low storage. If your memory usage is less than a low-level threshold, some suggestions are provided to free up memory. In general, you do NOT need to manage memory by using “task killer” apps. If the device information looks correct, select “OK”, otherwise select “NOK” (Not OK). Memory (total and available). 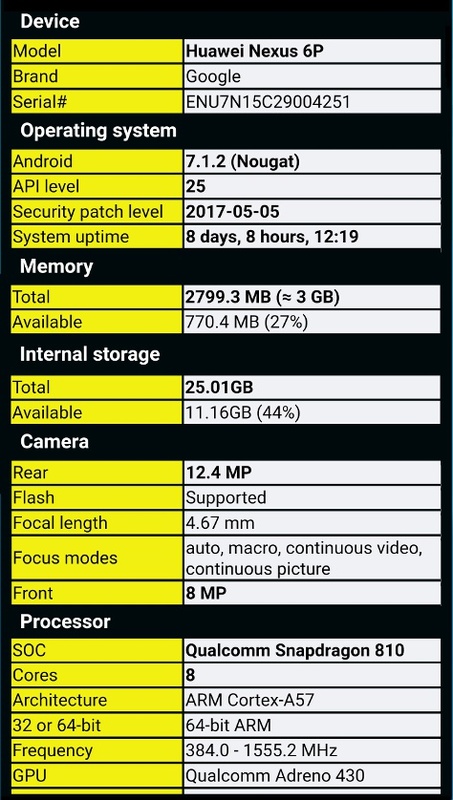 Please note: This is the total memory that the Android operating system can use, and is lower than the actual physical RAM on the device. Some of the physical RAM has fixed allocations and is set aside for other functions such as the GPU (graphics), the radio baseband CPU (mobile network functions) and DMA buffers (hardware subsystems). Camera (front, rear, video resolution). For more information about these items, please see: Operating System, Display, Processor, Memory, Storage and Camera.